EXPLORERS IS BACK ON TOMORROW SEE YOU THERE! For those of you that do not know where Beaudesert is, below is a map along with the address of the camp site. I think most (if not all) of you have given me your completed camp and consent forms, last week I gave out a further consent form which the camp site requires to be filled in before any of you can go rifle shooting. If you have not had one of these forms you ABSOLUTELY MUST fill in this form, if you do not bring this form with you, you will not be permitted to shoot. If you have not already checked out the kit list then please do so, please make sure you bring suitable footwear, the weather looks like it might be reasonable for us but the field will still be wet. This should be a good camp, see you all on Monday around 3 pm on-site, have a good weekend. As most of you know I am a bit of a fan of bushcraft. 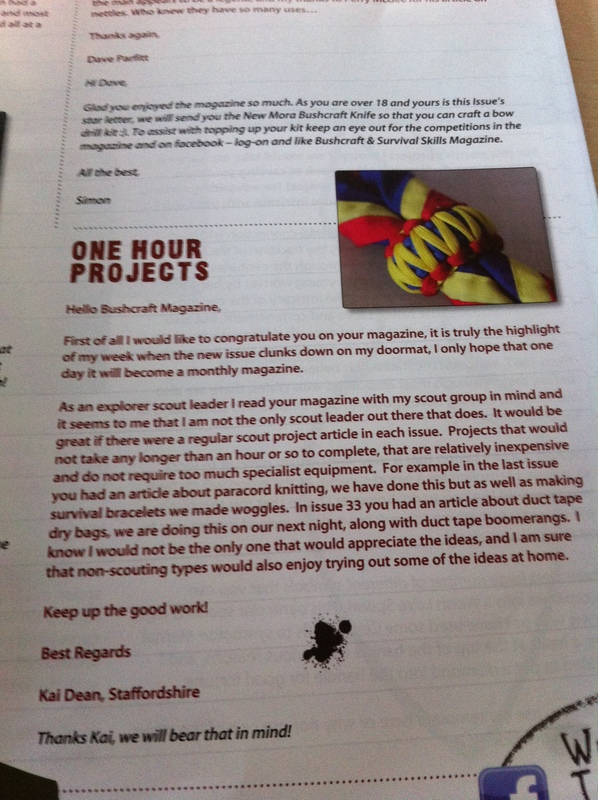 Last month I wrote a letter to Bushcraft and Survival Skills magazine along with a photo of our unit coloured woggles on my necker. This month’s issue has just arrived and my letter along with the photo has been featured this month, we are now national stars! 14:00 – 15:00 Arrive at camp, pitch tents etc. Just to confirm, the price of camp will be £70 each, if you want to come please bring your cheque, health and consent forms ASAP.